Antigua and Barbuda - Consisting of two islands, this island nation is roughly adjacent to St. Kitts. Antigua and Barbuda use the East Caribbean dollar. For conversion, see the Currency Converter under Travel Information on the left side of this site. There are 365 beaches on Antigua alone, (one for each day of the year). The great majority of these rest inside the calm, protected waters of the island's Caribbean side. All are open to the public. 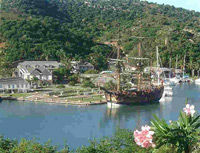 Antigua and Barbuda offer all the activities one would expect on a Caribbean island and go one step further. They offer a chance to experience the sport cricket. In fact, Antigua and Barbuda are so fond of the game, they have sent a number of players to the professional ranks. Visit Antigua's exotic sister island Barbuda for a day to remember forever. Explore the amazing Frigate Bird Sanctuary located on the island's northwestern lagoon accessible only by boat. The Frigate Bird Sanctuary is home to over 5,000 of these magnificent water birds. On arrival into Barbuda, take a short walk to the lagoon and board a small boat to the Bird Sanctuary where a local guide gives a narrated educational tour and fills you in with some facts about Caribbean wildlife! Discover the Frigate Bird which is a tropical marine bird of prey and is seen here in its natural habitat. Return to Low Bay for a sumptuous lunch on board the boat before spending 2 relaxing hours on the beach, where you can swim, sun bake or simply just explore the white sand shores of Barbuda! Depending on the weather, you may sail to another beach. Travel across the island of Antigua to the national park, in which lies the famous English Harbour and Nelson's Dockyard, named after Horatio Nelson who served in Antiqua in the 1700's. There will be time to wander around and view the Admiral's Inn, Copper and Lumber Store, Sailmakers's Loft, Mystery Pillars, Art Gallery and fabulous yachts moored to the old quay side. Visit the Blockhouse Ruins, overlooking the mighty Atlantic Ocean, Indian Creek, and on a clear day the island of Montserrat. Afterwards take a short visit to Shirley Heights for a bird's eye view over Nelson's Dockyard. Definitely the place to be on Sunday. Celebrate the most dramatic sunset in Antigua and the brightest moonlight nights. Dance to the sounds of steel band music while you socialize and meet friends both visitors and locals. Shirley Heights was named after former governor Sir Thomas Shirley, who was known as the man who fortified English Harbour in the late 1700s. But on Sunday nights it explodes into dance and music. Start by seeing a beautiful sunset and then stay to relax and enjoy the entertainment provided by talented local bands. Enjoy the latest Caribbean rhythms from one of the cities best local bands. Drinks and snacks are available for a small fee. This tour offers an exciting off-road 4WD experience, taking travelers to places of natural interest. 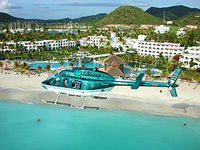 A great way to visit the renowned landmarks of Antigua from an unique adventurous point of view. You will have the opportunity to see Nelson's Dockyard, Devil's Bridge and Long Bay Beach. Throughout this journey, sample some of the seasonal fruits such as mangoes, pineapples or Guavas. Then it's time to visit Betty's Hope sugar plantation to relive the memory of the only working sugar mill on the island and learn how to make rum. A picnic style lunch will be provided under the coconut trees on the water's edge, a truly beautiful and cool Caribbean setting. Start this tour with a visit to the local vegetable market, then take a stop in the capital city of St. John's where you will visit the popular Heritage Quay for duty- free shopping. This is where everyone comes to shop for duty-free, designer and locally made products. This two-story shopping complex has plenty to offer for the hard-core shopper or just the casual browser. Located in the center of town, there are many colorful vendors in the area, selling the usual batik pareos, T-shirts, woven products, and jewelry available on all the islands. Take a walk up to St. John's Cathedral which was constructed in 1800. The Cathedral is built of freestone and is dominated by twin towers at the west end and provides a distinct baroque flavour. Then make a stop at the beautiful Botanical Gardens, which were established in 1893, for a delicious picnic style lunch. 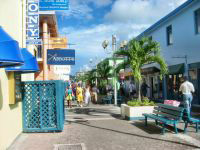 Departure Point: Tour departs from selected St. John's hotels or the cruise ship pier.